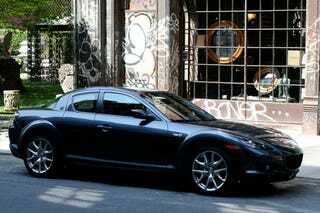 The 2008 Mazda RX-8 shows all sorts of pleasing shapes amidst all of that strong idiosyncrasy. It's good clean fun to look at the profile of the front fenders rising slightly above the curve of the hood while you're driving. Molded-in Wankelry on the hood flows nicely into subtle twin speed bumps on roof, but then the line drops into the rear, which is just kind of there. Our test car had the optional chrome Wankelry on the front and rear air dams. Frankly, there are better ways to spend $159. From outside, the infanticide —er, "Free Style" doors are well-integrated. Overall, a rather handsome car with "grows-on-you" versus "...Damn!" styling — although we hear the Mazda killer-guppy front fascia will be somewhat improved for 2009. The 40th Anniversary edition includes leather trim and seats in a color Mazda calls "Cosmo Red," but your parent's living room group knew it better as "Dusty Rose." It seems, unfortunately, like a compromise color. The exterior Wankelry extends to the interior in the shape of the shift knob, headrest inserts, special badges on the floor mats... Rotors, rotors, everywhere rotors as far as the eyes can see. The instrumentation is crisp, but the luminous blue LCD-lit dials (Warning! Digital speedo, Will Robinson!) contrast with the red LEDs in the center stack, giving a pleasingly patriotic affectation to the dash. Thank the Lord this was the 232 horsepower version (both motors have the same 159 ft/lb torque rating) of the RX-8, because it needs it all. Serious tail-twisting mechanical Wankelry is required to make time in this car, and it's a dog in traffic. On the numbers it might earn a third star, but persuading it to do so is more hard work than it should be. Very nice. Precise, smooth, lets you know exactly what's going on. And the calipers are plain old caliper-colored, despite recent attempts by automakers to turn them into some sort of jewelry-like accessory for your wheels. ABS shows up a bit earlier than many will appreciate. Should be far worse than it is for as well as it handles. You 'll know it when there's bad pavement underneath you, but you won't worry about it too much. Outstanding, gorgeous, superlative, predictable, and lots of fun. Whether you decide to steer with your hands or your right foot, this car will do exactly what you want all day. The RX-8 is a rather light car to begin with, but once it's in a groove it seems to drop about 500 pounds. A real hero-maker. Look, our car may be an anomaly, as many RX-8 owners love their 5- and 6-speeds, but this Aisin/Mazda co-manufactured gearbox was kind of a chore. Short throws aren't much of an advantage when you feel you need a home-run swing to select the next gear. Nine Bose speakers with 300 watts behind them and a fairly intuitive button cluster. Very good sound, but no MP3 player hookup. The 40th Anniversary Edition comes with just the normal stuff standard, like heated seats and Homelink and so on, although it's very well-executed normal stuff. But don't forget, it has fratricide —er, Free Style doors, if those count. We think they do. If you want one of these, it's worth it—What else is like it? However, at $32,594, you might opt for, say, the 350z or the G37 with their increased torque and normalcy, not to mention far better fuel economy. There's no denying the RX-8 is a lot of quirk and a lot of work. But this lovable oddball has charisma by the bucketload, even if you do need bucketloads of patience, good humor, and gasoline to live with it every day. Plus more than a few pails of high-quality synthetic oil. But even with all that, I'd own an RX-8 in a second. Maybe it's because I'm a dedicated oddball and a sucker for a light, agile, fairly unique car. Maybe that should worry me, but to hell with it — I'm not yet too old to believe that lots of good moves and a few big laughs just might make up for a little drinking problem.